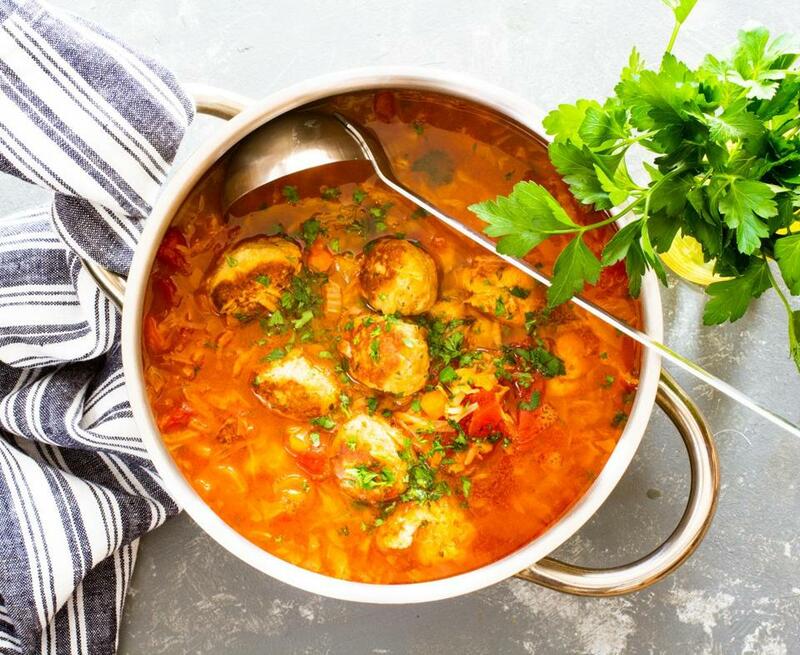 If you’re familiar with the ingredients that go into traditional Eastern European stuffed cabbage rolls — the green leaves, of course, which are wrapped around ground beef and rice, then simmered in tomato sauce — you’ll have a taste for this soup. Where the cabbage rolls take quite a bit of time to prepare and then cook, this pot of meatballs with cabbage and rice simmers in a sweet-and-sour tomato-based broth in 20 minutes. 1. In a food processor, work the bread or rolls into crumbs (you need a scant 1½ cups). Transfer to a bowl and add the milk. Stir well and set aside for 5 minutes. 2. Add the egg and stir well to mix it in. Add the beef, parsley, onion, salt, and pepper. Work with clean hands until thoroughly mixed. 3. With wet hands, form the mixture into 1½-inch balls. You should have about 28. Set them on a rimmed baking sheet. 1. In a large, nonstick skillet over medium-high heat, heat 2 tablespoons of the oil. When it is hot, brown the meatballs, in batches if necessary, turning them halfway through cooking, for 8 minutes, or until they are golden on two sides; set aside. They will not be cooked through. 2. Meanwhile, in a soup pot over medium heat, heat the remaining 2 tablespoons oil. When it is hot, add the onion, carrots, celery, cabbage, salt, and pepper. Cook, stirring often, for 8 minutes, or until the onion and cabbage are slightly softened. 3. Add the brown sugar and stir it into the mixture for 1 minute, or until it melts. Add the tomatoes and cook, stirring, for 1 minute more. 4. Add the lemon juice and stock. Turn the heat to high and bring to a boil. Add the rice and meatballs. When the liquid is bubbling at the edges again, lower the heat, and partially cover the pan. Simmer for 15 minutes, stirring occasionally, or until the meatballs are cooked through (halve one to test it) and the rice is tender. Taste for seasoning and add more salt, brown sugar, or lemon juice, if you like. 5. Ladle the soup into bowls and garnish with parsley.